The days of manually handling scorpions to extract their venom could soon be over. A scorpion-milking robot designed to extract and store venom could put an end to the tricky manual method traditionally used by scientists. Researchers at the Ben M'sik Hassan II University in Morocco claim their robot not only speeds up the extraction process, but also makes it safer. Scorpion venom is used in a variety of medical fields, including cancer research, and the development of anti-malarial drugs. 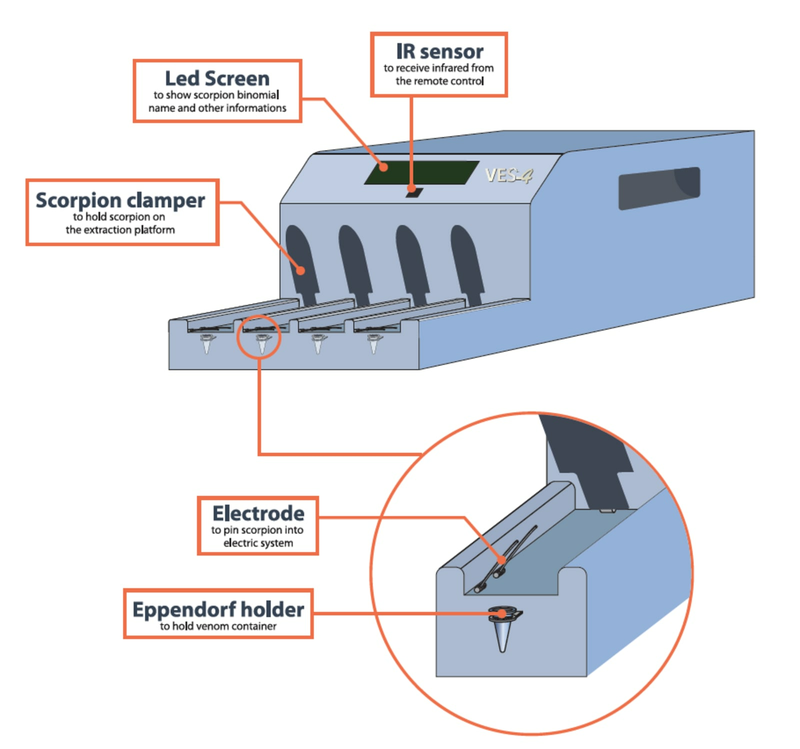 Current harvesting methods include electrical and mechanical stimulation, which can prove deadly for the scorpions and troublesome for scientists, due to electric shocks from the equipment. Not to mention the fact that the mere thought of grasping a venomous arachnid sounds pretty darn terrifying. The lightweight VES-4 device created by Mouad Mkamel and his team of researchers is a portable robot that can be used in the lab and in the field. It works by clamping the scorpion's tail and electrically simulating the animal to express droplets of venom, which it captures and stores. The VES-4 wouldn't be the first robot to be utlized by medical scientists. In the past, robotic devices have been used to design drugs, with researchers also recently suggesting humanoid robots be employed to grow human tissue grafts. "[VES-4] is designed to extract scorpion venom without harming the animal and to provide more safety for the experimenters," said Mkamel. "It could [even] be used by one person using a remote control to safely recover scorpion venom remotely." The robot has been tested on multiple species of scorpions and can be programmed to remember them via its adjustable settings. It also contains an LED screen that displays the name of the species being milked.